Early August and I’m not jumping for joy at the heat-lover yields I’ve been getting. A couple of eggplants, a half-dozen almost-ripe cherry tomatoes, a few small summer squash and one good red pepper. But it’s looking like maybe, just maybe, a harvest is around the corner. And until then, I’m doing great on potatoes and green beans. Here’s a few scenes from the garden right now. Asian Pears are small but the earliest varieties are already sweet and juicy. Sometimes I “thin” 3 or 4 a day into my mouth while wandering the garden. Earliest apples are still a bit puckery, but they are edible and getting better every day. 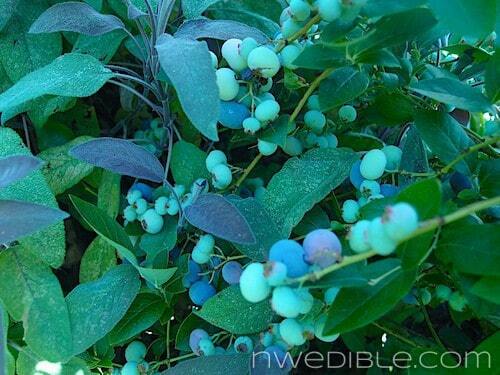 Blueberries are coming on well. Because of the way a handful of berries ripen at a time per bush, most of the harvest so far has gone into our mouths without ever making it inside. No jam, no freezing. Still, when I add it up we’re getting about a pint or two every three days from what are, essentially, landscape plants. 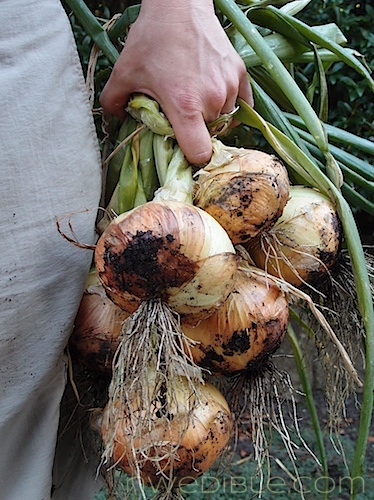 I harvested onions a few days ago. This year’s yield on onions wasn’t near enough to see me through the year. However, nothing destroyed my garlic this year, so on the whole I’m feeling ok on alliums. 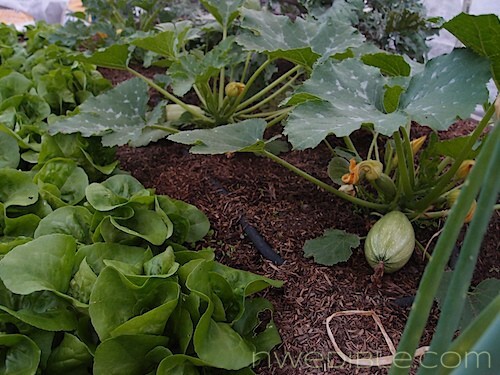 The hugelkultur beds are crazy in a good way. I don’t subscribe to any particular “school” of gardening . I’m not a dedicated permaculturalist or square-foot gardener or anything. I’m more a pick-and-choose type. I’m glad I picked and chose hugelkultur. These beds have been watered once this year. They are producing an insane amount of biomass. My corn is forming up and getting bigger every day, I’ve got squash climbing trees (not kidding – had to unwrap a vine that had climbed up and around a tree) and the beans are doing great. 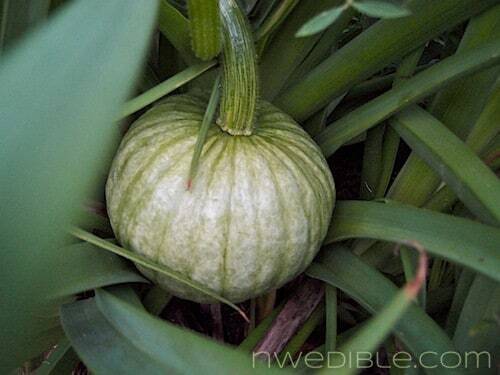 This pumpkin is forming up inside the leaves of red hot poker. The vine that it’s hanging from must be 15 feet long. I’m not kidding, the squash are traveling. 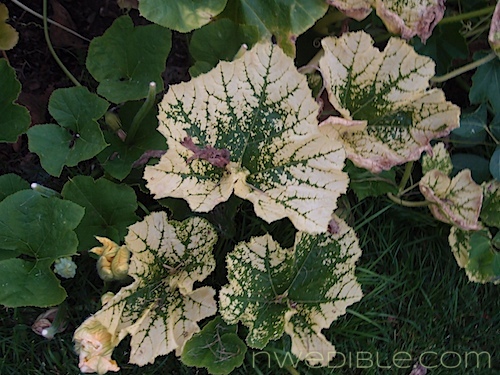 One of the “compost squash” volunteers has thrown these gorgeous variegated leaves. I think I’ll keep the seeds from whatever this ends up as just to try to hold on to that leaf pattern! The rebar and mesh trellises have done great. The only issue is some of the beans are growing in a tangled pile at the top because they’ve run out of things to grow up. 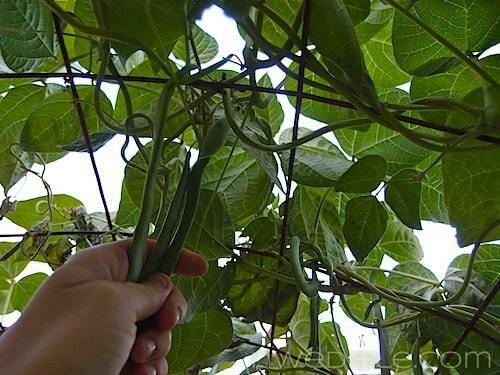 But many of the beans just hang right through the mesh. And I have to say, I really enjoy the feeling of being literally surrounded by my plants as I harvest. The back beds are a bit of a disappointment thus far. This growing area is slowly, slowly succumbing to diminished hours of light due to trees a few property plots down from mine. What was a short 10 minute mid-day shadow at the height of summer when we first started the garden has become about an hour-plus long black-out for about half the beds. 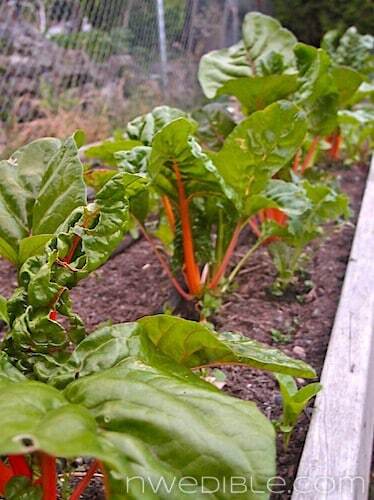 Chard will be big enough going into fall. 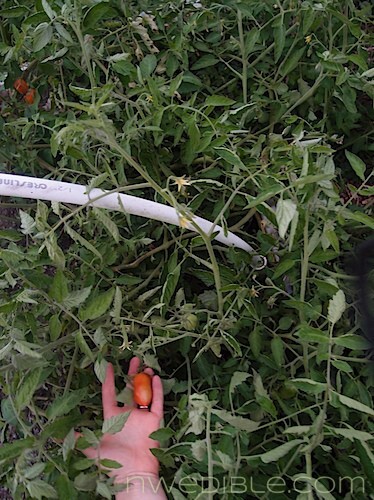 Tomatoes are making a lot of leaf but are just now starting to ripen fruit. 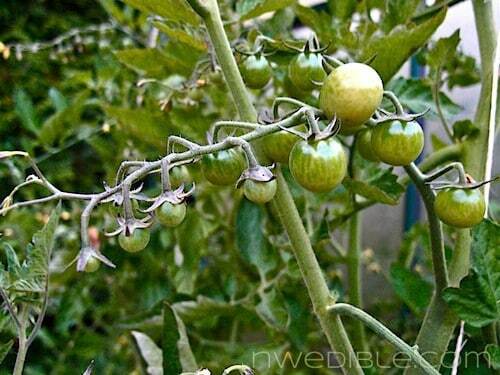 Most of the ‘maters are still green, green, green. This Cousa-style summer squash is my new favorite. It’s like zucchini but kinda oomphier. I like the texture, it’s nice and dense and the skin is thin. 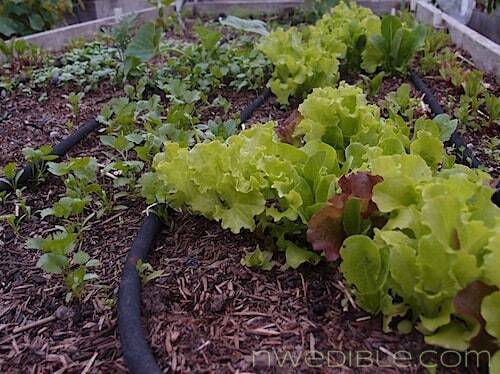 Lots of nice butterhead lettuce in this bed, too. The next round of lettuce blend is coming up with my last, late sowing of basil, cilantro and dill. If I’m lucky all this stuff will make it to a nice size for pureeing into pesto. Summer squash isn’t quite the size I’d like to see this late in the year, but I am harvesting enough squash for twice-weekly fresh eating. At least I’m not overwhelmed by baseball bat zucchini, I guess! The fall crops are in, for the most part. This is broccoli for fall and early winter. 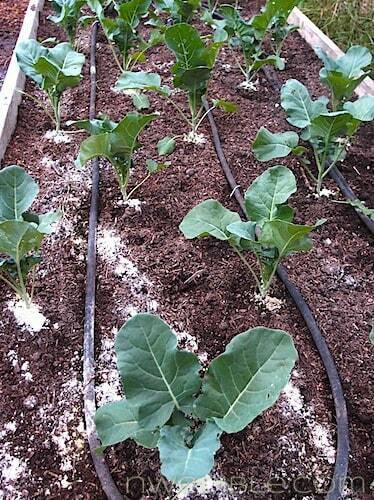 The white stuff is diatomaceous earth, my insurance policy against the maggots that f-ed up my spring broccoli. 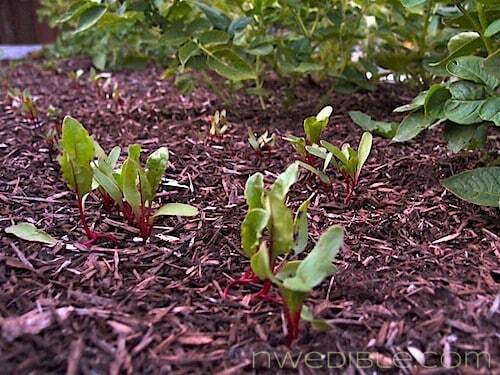 Seeded fall crops, like beets and carrots, are coming up too. I did a front-yard display garden again this year. It’s just so people walking by can see what broccoli or peppers or beans look like when they aren’t wrapped in plastic on a grocery store shelf. 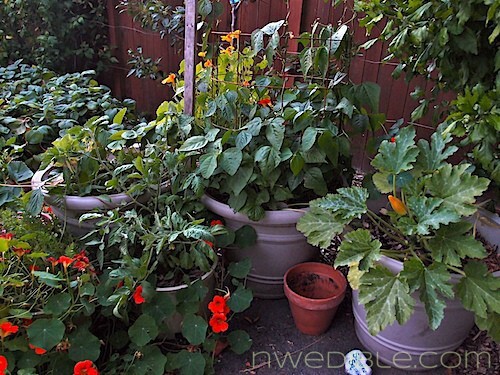 Yet I manage to get a surprising amount of harvest from this collection of pots! The front beds are doing well and are an ode to concrete reinforcing mesh at the moment. 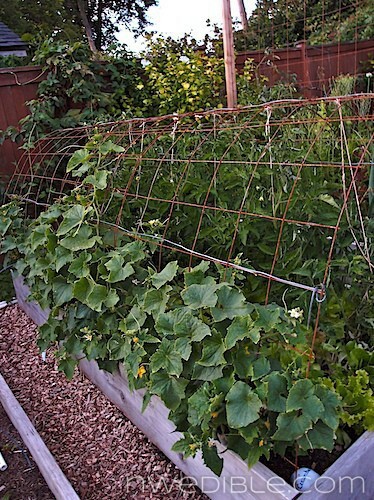 The upright mesh supports tomatoes. …and shading lettuce in the middle. 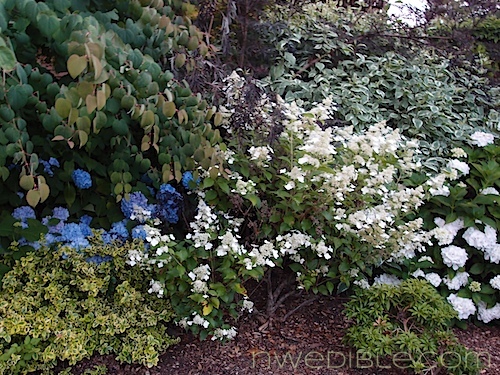 And there is a little room left over for some stuff that’s just pretty, like this assortment of hydrangeas. Blog news: several readers have asked if I am hosting a Nosy Neighbor Urban Homestead and Garden Tour again this year like we did last year. Not this year, I’m afraid, guys. After my car wreck in late June I just didn’t have it in me in July to do much of anything, including plan a virtual garden tour. But since there appears to be an interest, I can definitely put another Nosy Neighbor Tour on the forward-looking list for Summer 2013. And, if you are interested, we can do a fall 2012 virtual pantry tour where we could all brag about our home canned tomatoes and jam. You can show off store-bought cocktail-onions and gatorade or caches of MREs, too, if you want – it’s whatever food storage means to you. There aren’t a lot of rules. October/November-ish? Who’d be interested in something like that? Let me know your thoughts in the comments. How’s your garden growing? 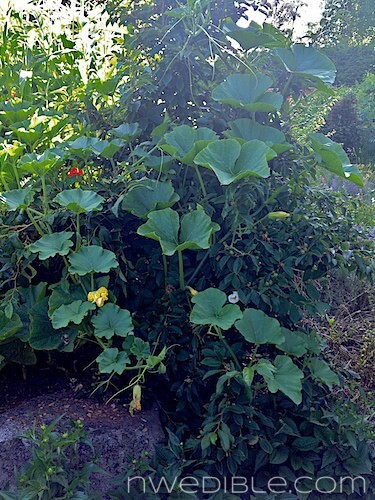 Are your zucchini’s swamping you? Man, I wish I was being swamped by zuchinni! My nemesis, the squash bag, was out of control this year! I started out hand picking & squishing them (yuck) but they got the best of me. Took out all my summer squash, pumpkins and melons. 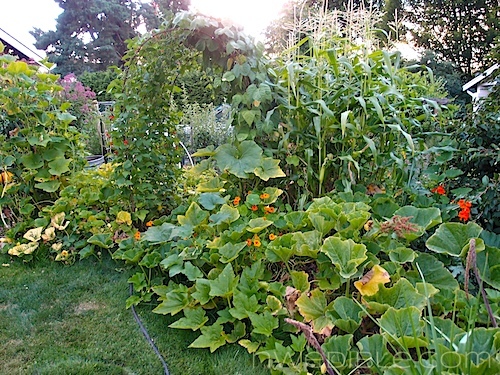 We have replanted some summer squash since they grow so fast…and I did have a few small sugar pumpkins that were ready before the vines died….but I’m hugely disappointed. Do you get squash beetles up there? I can’t seem to find an effective organic control. I would love to know if anyone has found one. Everything else has been a success though, and I’m preparing my fall beds today. Have you tried neem oil? It doesn’t work on the adults, but is great against the soft bodied nymphs. That and an occasional squish fest has helped keep them in check for me in our long hot southern growing season. I had tried neem oil for the adults, but never the nymps. Thanks Shannon! I’ll give it a shot. I don’t have an overwhelming abundance of anything, but I’m getting meal-sized harvests of beets, kohlrabi, and bush beans right now (Zone 3). Those variegated squash leaves are nutty. Curious to see what fruit they make. Perhaps a new cultivar is born? 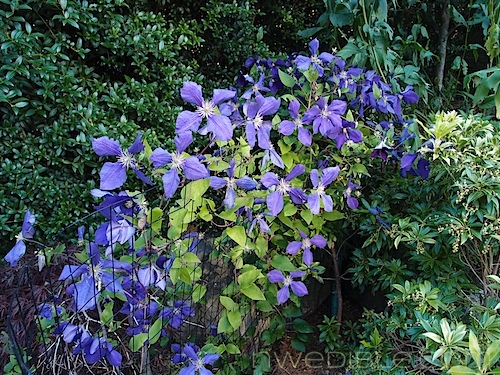 I had a clematis in a little two inch pot for two years that I just could never get around to planting. It ‘died’ twice, and came back because it’s hard to keep such a little pot adequately watered. I thought it deserved a better life, and planted it at my sisters last fall. This spring we couldn’t find it. Maybe all the freedom scared the poor little guy. Down here in the SW US, it’s still quite hot on a daily basis, but the humidity is up with the monsoon rains (of what little may fall), so a second flush of growth is appearing on many of the plants – veggies, roses, etc. Have pulled most of the San Marzano tomatoes already as they have produced enough for me to put up 15 pints of sauce so far, and the hornworms are waging a fair battle. Time for the fall-planting prep, anyway. Zucchini failed, as did the tomatillos. Miserably. Finally pulled the last of the beets and canned them – anxious to see how those turn out. Pickled the jalapenos yesterday – have a few pints of those for pizzas and enchiladas. Oh, and by the by – got a chuckle out of the typo in the paragraph between the photos of patty-pan squash and the broccoli starts. The first few words made me laugh out loud!! Don’t fix it just yet – it’s funny! Well DONE! Garden envy is about to overtake me. I have a virgin garden ie. once rototilled, not quite deep enuf. No soil tests but WSU says most soils in the area need lime. Didn’t get it in yet. 33 tomato plants started from seed almost all bearing green fruit as I write. Peppers going crazy, red and jalepeno. Ant hills moving around the garden driving me crazy. Giant population of dragonflys and ladybugs making us happy, wasps and yellow jackest too. My son says,’these are the most polite wasps he’s ever me”. Carrots in late, beets doing well enuf, bush beans okay after running off one deer caught in the act! Onions not good, not sure why (from seed). Trying to scrounge up canning supplies and the cheap is becoming quite a challenge. (thrift stores-yard sale budget) This is a VERY canning busy community. Ah well, you are my new hero, may not even look at any other garden blogs again. We’ve got potatoes, onions, a few beans, enough cucumbers to keep us in fridge pickles, small hand fulls of blueberries, and green tomatoes galore. I’ve eaten a little backyard basil to. Chard and Brussels coming in for the fall. Overall for my first real year, I think I’m doing all right. Completely interested in a pantry tour! Love that idea. 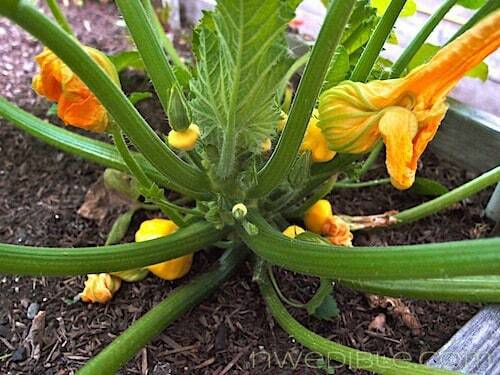 Pumpkin and squash family cross pollinate very easily. The seeds won’t come true since they are already the cross between mother plant and something else…..
Watch out for pepo volunteers. +1 squash volunteers usually taste like cardboard. p.s. diatomaceous earth never did anything for me in the garden. Diatomaceous earth only works when it is dry. An hour of shade from your neighbor is hurting one of your beds? That doesn’t seem like a significant enough amount of shade to harm any plant. I have allium-envy. 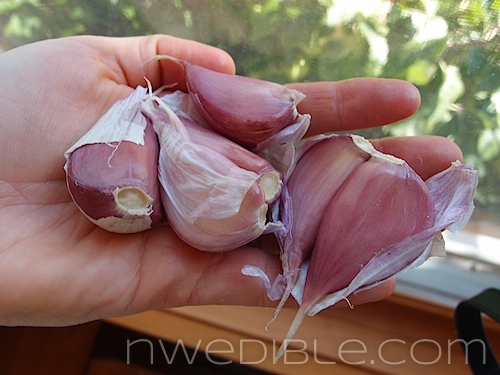 Those garlic cloves, not even garlic heads, those cloves are almost as big as the palm of your hand! I like your purple display pots. (All your pics are inspiring!) Did you paint those yourself? 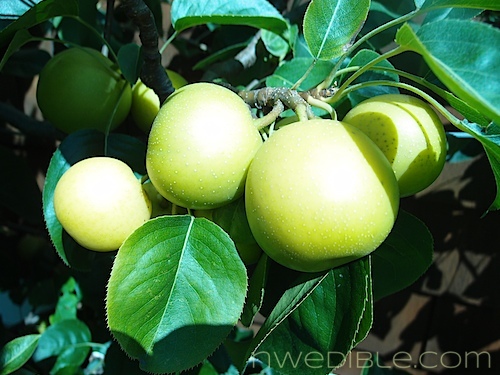 Did you do any research on cultivars before you planted your Asian pear? 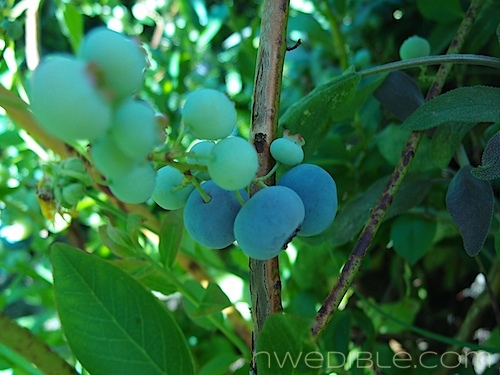 I am looking for something that is good for our Northwest climate that I might get lucky enough to find on dwarf rootstock. Just curious if any research you might have done led you to picking a specific tree? We have room for about 5 trees as long as they are all dwarfs, trying to maximize space and extend the fresh fruit season as long as possible! Love your garden. I’m in eastern WA on a lot that is blasted by wind all spring. My poor plants sort of hold on in desperation until about mid June. We had a cool wet June and the wettest July on record in the Tri-Cities… So stuff is green, but not producing much. Anyway, your clematis is so beautiful and I’m so jealous. Mine has been in the ground for three or four years and puts out a measily one or two vines and blooms. It’s on the windy side of the house, but there’s no where on the leeward side where I could put it that easily. I bet you can plant it and it will be fine. I have no idea what my garden is doing apart from yielding an insane glut of raspberries, which my husband has been staying on top of, bless him. I will not be allowed to weight bear on my right knee for another 2 weeks, alas. See blog. But I thoroughly enjoy your blog, and would love to buy your book for my kids, who garden in Vancouver, B.C. Looking good Erica! I’m in Melbourne, Australia, so my garden looks VERY different to yours at the moment. My plantings of winter crops were all very, very late because I was heavily pregnant when they were supposed to be going in but good rainfall and plenty of sunshine has helped to catch things up. The harvesting is just starting to ramp up again, with carrots, beetroot, radishes, spring onions, bok choi, rainbow chard, cavalo nero and tatsoi coming out of the veggie patch. There are a couple of limes still left on the tree, and rhubarb has been going strong all winter. Asparagus is just starting to peek through the ground. I even had a couple of tiny (but tasty) raspberries randomly appear on a Nootka raspberry plant – in August! Not sure if they were very late or very early. I got here via your recent coupla posts on MMM, and I’m seriously inspired. I zipped through your recent pantry post and found myself here, having just started a garden this year it’s not near as impressive as yours. In fact the only thing that grew really well in my garden was the zuchinni. But I have space and (a requirement in Northern CO) an area set aside with a sprinkler. Virtual pantry show great idea. Would love to see what everyone is canning. So many great ideas. 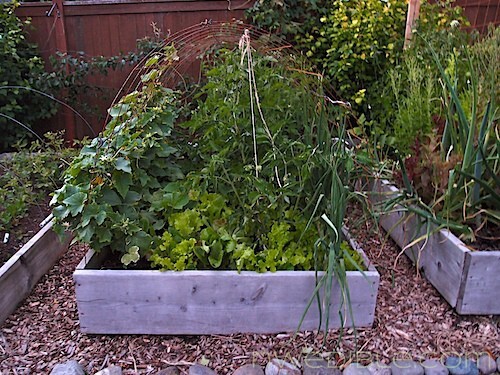 Your garden looks great and so organized. Thanks for sharing your ideas with us!